October is special around here. We offer free house cleanings to women battling cancer every day but we spread the pink on thick in October — one month of honoring the women we’ve met who have battled cancer. Here are a few ways we celebrate Pinktober at Buckets & Bows Maid Service and you can too!. Pinked Out Ads Ads that feature someone real and local, especially someone you might recognize or know, attract attention, so we feature the women we serve in our October ads. Who better to talk about how it is to battle cancer and what a free house cleaning means than the women impacted themselves! They draw attention to the Cleaning For A Reason mission and connect us to other local women who can use our services. Thanks to the Cross Timbers Gazette for donating this beautiful ad! Local Volunteer Day This is our second year of organizing a few teams of volunteers to clean the homes of families living with cancer and we’ve got a fantastic partner in Texas Health Presbyterian Hospital Flower Mound! Buckets & Bows Maid Service provides all of the cleaning supplies and the ‘crew chiefs’ and the hospital staff volunteers to spend their day in service to others. This year, with 14 volunteers, we cleaned four homes in Flower Mound and Lewisville. It makes us all realize how lucky we are and just how hard professional house cleaners work every day. Most of our days don’t end with hugs from customers but this one usually does! First-Ever Cleaning For A Reason Volunteer Day Debbie Sardone, founder of Cleaning For A Reason and owner and president of Buckets & Bows Maid Service, calculates that every week the non-profit gets 20 phone calls from people offering to help clean for women battling cancer. And until October 26, C4R has turned away these volunteers; professional residential cleaning companies or maid services provide the free house cleanings. But now, with the first-ever Cleaning For A Reason Volunteer Day in the books, there will soon be a way to say “yes” to those volunteers! This pilot in Dallas is giving ISSA Charities, of which C4R is now a part, the opportunity to fulfill its mission of providing free house cleaning to families living with cancer while they work out the processes for hosting similar volunteer days around the country. Twenty families were served in this single pilot bringing together seven Dallas-area maid services and numerous partners and sponsors including Bissell, CleanPacs, Quick Trip Movers, Thornhill Catering, and Visit Dallas! Original Speed Cleaning Aprons in Pink The original apron is Speed Cleaning’s signature product. It’s at the heart of executing the Speed Cleaning techniques and cleaning a home in the half the time while delivering quality and consistency for customers. 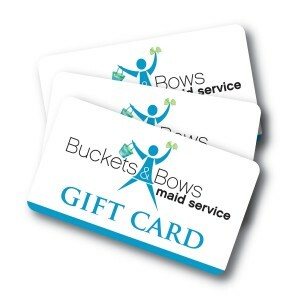 Every Buckets & Bows Maid Service cleaning tech wears one; it’s part of the uniform! And it’s even prettier in pink. Visit Speed Cleaning for yours. See the quantity discounts for a set for your whole team. Pink Chocolate Chip Cookies Here’s how to bring a smile to someone in your life who has fought the fight — with this sweet treat! Or host a bake sale for funds to benefit cancer research.